This is the corner of Church Street and Rest House Road, right outside the entrance to the offices of Wipro & Times of India. Church Street is Bengaluru’s most happening street, packed with pubs, restaurants, cafes and bookstores, and always full of people having a good time. If you had to pick one street that symbolized Bangalore, it would have to be Church Street on a weekend. But there is a dark side to Church Street – ugly spots like this one. 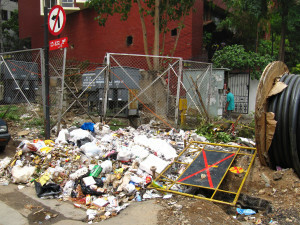 This ugly mess is a symbol of what is going wrong in Bangalore. Well, in India. It’s October 2010, Bangalore is India’s boomtown and the global tech capital, and its proud citizens have seemingly done a lot of things right. Over a million migrants have moved to this city in a decade seeking world-class jobs and a better life, and global companies have flocked here to set up shop, recruit people, outsource services. Yet, right outside major company offices, on busy important streets, in the heart of the city and in plain view of everyone, are ugly ‘spots’ like this that nobody seems to be able to get rid of. This is by no means the only one – there are many more, every fifty metres or so. It just isn’t right. 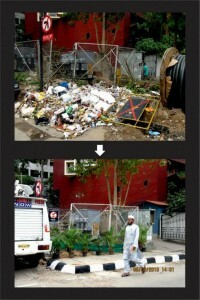 It seems that everyone wants to get rid of these eyesores, but nobody seems to know what to do. Or if they did, nobody is doing anything about it. It shouldn’t be that difficult to keep a street clean, especially the important streets in the centre of a city that is positioned as the poster-child of 21st century India. Apparently, it is. They have spent two days observing the spotat different times of day, and been talking to people who walk by. The citizens of the online world are brutal – they only care for instant gratification and real results. So are citizens in the real world. They too only care for results. Anyone who has worked in a position of authority (in government, or a building society, or a Resident Welfare Association) knows how hard it is to satisfy the fickle citizen, who always demands instant visible results to what he considers his pressing civic problems. V & X know that and have focused all their energies on delivering this dramatic result, this single Before-After image, that is proof of dramatic change. And it has worked – in terms of creating initial positive impact (both on the ground and online). Whether it will survive and change community behavior is another story. But this initial impact is crucial, as we will discover later, in generating respect from the community and the authorities.